Great quick knit for a holiday gift, or just something to gift yourself as the temperatures are dropping. It is a fun knit and is what I would consider an experienced beginner pattern. This is a slipped stitch technique so it will require a cable needle. 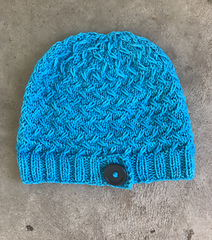 This hat pattern was originally created in the Jimmy Beans Wool’s Limited Edition August Semi-Precious Tosh Bloodstone color, which is now sold out. However, it will work perfectly in any solid, variegate, or speckled skeins you have lying around. One size meant for average 22-inch head circumference. There are modification instruction available in the pattern if you would like to adjust the sizing. 1 Large button, 30 MM Black button used.